Starting university is nerve racking for the best of us, but inspiring young adults like Gina Preston are proving that you can achieve anything. There is no doubt that it can be worrying to find out your child is hearing impaired, but the reality is, with the technology and therapy available from organisations like Hear and Say, anything is possible! Gina Preston, is a prime example of how hearing impaired youngsters don't need to let their hearing limit them from achieving their dream career. Gina was diagnosed with a hearing impairment at 13 months old and received cochlear implants at two years old. While it certainly wasn't a smooth road for the Preston family, it has been a rewarding one. Things looked up when they moved from the UK to Australia and joined the Hear and Say family, where Gina learnt to hear, listen and speak through auditory-verbal and audiology therapy. This therapy opened worlds for Gina by allowing her to attend mainstream school, graduate from TAFE and now have unlimited career choices. 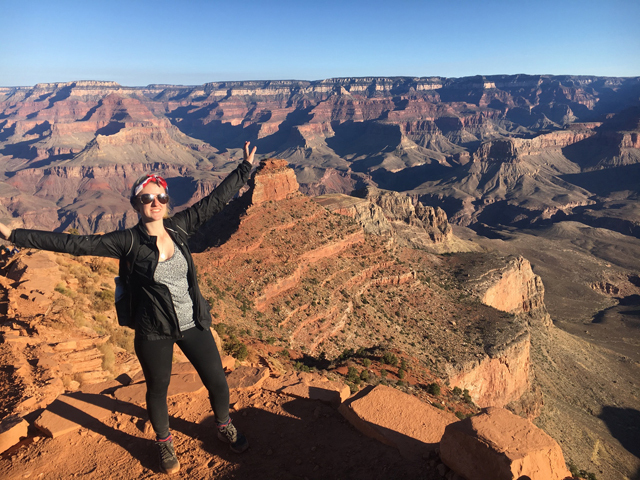 Due to the evolving technology and support, Gina has developed communication skills alongside her peers - she's travelled the world solo and has now landed her dream job at a global engineering firm. Question: How does your hearing impairment affect you, now? Gina Preston: Technology has improved so much that I can now listen to music/talk on mobile phone wireless and connected to Bluetooth but hearing on the phone is much clearer and can hear in non-noisy rooms. I don't feel my hearing impairment pulls me back, only in noisy environments where I struggle to hear and over normal work/home phones. Question: Can you talk about the services Hear and Say provided, for you? Gina Preston: Hear and Say supported me and taught my family how to understand and help me as a child with hearing loss. Hear and Say also taught me to hear, listen and speak through early intervention, technology and using auditory-verbal therapy. They provided social interaction through playgroup at young age and then through STAR which focuses on social skills that help build resilience and mental well-being through effective communication for teenagers. Question: What message do you have for parents whose children have a hearing impairment? Gina Preston: My family decided that they wanted me to be happy along the journey, make it fun and stay close as a family and work through it together. They also wanted me to be a part of the hearing community as they felt I would enable me to fulfil my potential. There is definitely a level of commitment from the child, the family and the professionals at Hear and Say and you need to put in hours and practice but at the same time doing it in a fun way and creating positive environment. Question: What advice do you have for students beginning further study like TAFE and University? Gina Preston: Firstly to build a good relationship with the lecturers/teachers in order for them to understand and support you. Also I highly recommend get student services help, they help and support you based on your needs. They made a huge difference to my studies. Question: Can you share any study tips, with us? Gina Preston: Study tips would be use flash cards; they are super helpful testing your memory and formulas etc. Also to always take notes in class as I found that they were helpful for exam questions and assignments. Lastly, I would make the most of using student services such as tutoring. Gina Preston: I love to travel, so far I've been to North America, Europe, Africa, New Zealand, Canada. Travelling solo has been just an amazing and fun experience and I will continue doing it. I'm currently planning my trip to South America which is super exciting. Other exciting things is that I've bought my first house, so I've been having fun being first home owner. In my work life, I got hard at work – I'm ambitious. I plan to achieve my goals in my field and I'm looking forward to being a project manager. I am also still involved with Hear and Say (I get my cochlear implant mapping done there on a regular basis) and love to help others anyway I can on their hearing loss journey. Recently I've hosted Loud Shirt Day to raise funds for Hear and Say who rely heavily on community support and contributions to ensure they can provide their services to families who have children with hearing loss. I am passionate about helping people and having a positive impact on the community.